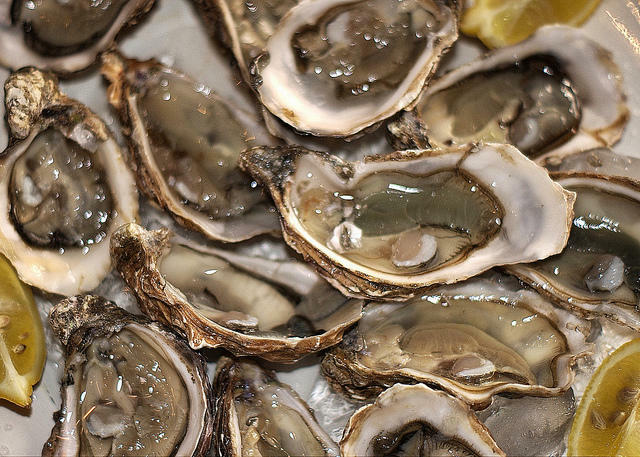 North Carolina's oyster sales doubled between 2005 and 2012. Oyster growers, researchers and enthusiasts gather in Raleigh today and tomorrow for the North Carolina Oyster Summit. Food writer and oyster expert Rowan Jacobsen will give the event's keynote address on the rise of oysterculture in the southeastern U.S. and North Carolina. He wrote a book, A Geography of Oysters: the Connoisseur's Guide to Oyster Eating in North America (Bloomsbury USA/2007). Guest host Phoebe Judge talks with Jacobsen about what makes North Carolina a potential player in the oyster market. She also speaks with North Carolina oyster farmer Chris Matteo about his oysterculture experience and coastal ecologist and research assistant professor at the Institute for the Environment at UNC-Chapel Hill Lindsay Dubbs. Certain places are known for their indigenous foods. Vidalia, Ga. grows sweet onions. The banks of the Indian River in Florida produce outstanding citrus fruits. In some cases, governments go as far as to designate these special places with geographical indications. But what makes some geographical indications associated with certain foods and drink profitable for the farmers and producers in that area? N.C.